This is one of those games that I knew next to nothing about, but decided to buy on a whim. Lets face it, a cool cover and solid gameplay is enough to warrant a purchase. It’s why I like surfing Amazon’s retro games once in a while to find the hidden gems. Alter Echo’s definitely quite a lot of fun. It’s not quite on the same level as Eve of Extinction and Oni as those games were phenomenal, but it’s another good entry for the PS2 that holds up really well. The plot is certainly original. So, humanity has gone pretty far. We now have telepaths to an extent who can reshape things. One day, a group of humans stumble upon a planet where they had sent a few others many years ago. It seems like their time in space has turned Paavo’s expedition evil so they now want to wipe out humanity. Our 3 proud heroes decide to stop them, but they are split up when landing. Nevin decides to find them and get off the planet while he can. He meets with an artificial intelligence that is the actual planet and it begs Nevin to help him stop Paavo. Nevin declines whole heartedly and gives this entity a hard time throughout the game, but it finally gets personal when the body count starts to rise and he realizes that there will be nowhere to escape to if Earth is destroyed. He reluctantly agrees to help and fortunately, the entity gives him a power suit and an assortment of weapons to bolster his abilities. The plot is definitely going all in with the science fiction. That’s a smart move since it makes everything cooler. The opponents that you’re fighting are technically entities made of telepathic energies and all, but you can think of them as aliens. The designs are really cool and Nevin’s suit is also like something out of Iron-Man. The gameplay is pretty straight forward. It’s a 3D action title where you’ll be doing a lot of fighting. In standard mode, it plays out like a Link title. You swing at anything that moves. You have a beast mode which lets you climb onto objects and enemies alike. Finally, there’s Gun mode, where you turn into a large mecha and start blasting away. You’ll find that human mode is the most reliable, but you’ll have to use them all since some enemies are impervious to your different forms. There’s an aspect of platforming to this game as well. You’ll need to activate nodes across the levels at times or get from one place to another with your acrobatics. There are also some puzzles for when you are deciphering a node. Don’t worry, they’re the good kind of puzzles. It’s all about reaction times as you must make the right turn. This also happens when you use your time manipulation to strike at enemies. It’s a really handy ability that I recommend using whenever possible since it gives you extra currency to spend on upgrades. I maxed out all of my powers and bought some combos as well, but you won’t really find yourself needing the combos. Button mashing works well enough on all of the opponents. The game is fairly easy although the final boss will give you a run for your money. He has two phases and if you lose at any point, you must start again. Luckily, while I did die against the first phase 2-3 times, I never lost to the final one. That would have been demoralizing. It was very tense though since I won at the very end of my health bar. I always give my clutch factor some credit there along with the developers since nothing is more satisfying than winning at the very end like that. The same thing happened to me in Breath of the Wild and Kingdom Hearts II. It’s a good feeling. For the final boss phase 2, I recommend just baiting out his attacks and then punishing them. It’s a fool proof plan. Alter Echo also ends with a big cliffhanger although a sequel is unlikely. Spoilers are present for this paragraph to skip it if you must. You ready? Well, it would appear that the entity is also evil and the heroine lives after all. She had seemingly died a while back so it’s good to see that she survived. That being said, she’ll probably be turned evil or not given a choice so that’s too bad for her. The other villains are also alive as well. The sequel probably would have been a blast so it’s a shame that it didn’t happen. The plot wasn’t particularly strong, but it still would have been enjoyable. The graphics are good. They aren’t anything special, but the levels are fun to look at since the space theme is good. I will admit that all of the levels look the same though. There is no real variety to speak of since all of the levels are on the planet and in the caverns. This was a little lazy on the side of the developers so that’s something that could be fixed in a sequel. The time stop attacks look really good with purple energy all around. As for the soundtrack, it’s also really good. The themes are all really fast paced and increase the intensity of the levels. I’d definitely like to see the tunes return in a sequel. Unfortunately, there is no replay value here. Once you beat the game, you cannot replay the levels to get the extra power ups. Your only option is to replay the game and that would purely be just to have fun. It’s a game that you complete and then put back on the shelf. The playthrough is good though so this isn’t a bad thing, but I always like to have some replay value. It gives the game an extra boost if you ask me. While the game is good, there are clearly some negatives since I’m only giving it a 7. As I mentioned, the story isn’t great. It’s not bad and showed signs of promise like whenever the two friends would appear. It just suffered from some slow parts where nothing would really happen during some levels. The gameplay could also be a little repetitious since you would have to keep shifting forms to deal with various enemies. It wasn’t a big deal though and I still enjoyed the gameplay. These are just elements that hold it from being an 8. I did enjoy the puzzle system for the time stop attacks though and I’d definitely keep that for the sequel. 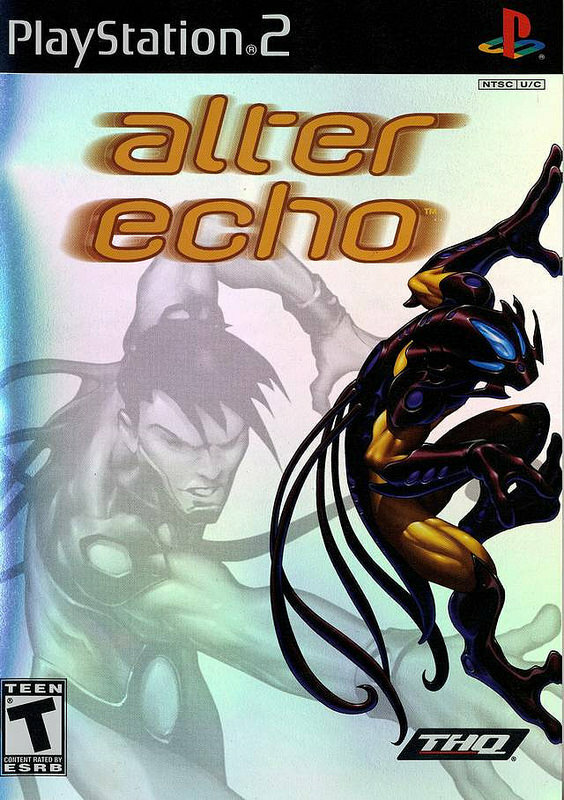 Overall, Alter Echo is a solid game and one that I would definitely recommend. It’s fairly short and won’t last you too long, but the gameplay is on point. The soundtrack is solid and the plot isn’t bad either. It’s the kind of game that nobody has heard of so it’ll also earn you some brownie points with other gamers when you mention that you’ve played such an obscure game. It had some issues like the levels being repetitious along with the gameplay to an extent, but that’s where the short length actually came in handy. Hopefully we get more space games soon, but I doubt that’ll be a problem. Space games are always going to be seen as cool. This entry was posted in 7 Star Games, Game Reviews, Games, Reviews and tagged Alter Echo, Game, Game Review, PS2, Review, Sci-Fi, Sony, Video Game, Video Game Review by dreager1. Bookmark the permalink.